After starting as an English teacher, Mr. Hoy was president of the higher education board 23 years. As president of the organization, Mr. Hoy worked with public and private colleges and universities to promote cooperation on education initiatives. He was a pioneer who often had ideas “before they reached their time,” said Harney, the executive editor of The New England Journal of Higher Education. The first member of his family to attend college, Mr. Hoy graduated from Wesleyan University in Connecticut, where he left a legacy of increasing student diversity during the years he worked in his alma mater’s admissions office. Mr. Hoy, who was president of the higher education board for 23 years, died of pancreatic cancer July 9 in his Duxbury home, where he had lived for almost 30 years. He was 79. Having started out teaching English, he spent most of his career trying to improve higher education initiatives. Mr. Hoy made education an integral part of his life and could turn any situation into a teaching experience. He once arranged impromptu swimming lessons for children at a hotel pool. “He always had something to tell you and teach you if you wanted to listen,” said his son Peter Hoy of Brooklyn, N.Y. While at the New England Board of Higher Education, Mr. Hoy helped establish the New England South African student scholarship program, which enabled New England colleges to support students enrolled at universities in their apartheid country. He also changed the organization’s publication from a newsletter to a quarterly magazine. What once was Connection is now called The New England Journal of Higher Education. “In a way, that journal, that magazine, really summed up his take on NEBHE, because it was called Connection, and it was about how higher education related to all of these other things,” Harney said. John Craven Hoy, who was known as Jack, was born and grew up in Yonkers, N.Y., where he graduated from Gorton High School. At Wesleyan, he received a bachelor’s degree in history in 1955 and a master’s in liberal studies in 1961. After graduating, he taught English at schools in St. Louis and Chicago before returning to Wesleyan to be assistant director of admissions from 1956 until 1959. During the early 1960s, Mr. Hoy directed the admissions office at Lake Forest College in Illinois. Then he became the dean of admissions at Pennsylvania’s Swarthmore College in 1962. He returned to Wesleyan in 1964 as the dean of admissions. Under his leadership, the university began accepting more students from modest economic backgrounds, specifically those from African-American and Latino communities. “These students see education in a different light than the students who assume they will go to college because it is the expected thing to do,” Mr. Hoy wrote in May 1965 for a Wesleyan publication. Mr. Hoy also worked as the assistant to the president and dean for special academic affairs. He created programs to recruit students, and he traveled to Africa in 1966 to interview possible potential scholars. Mr. Hoy left Wesleyan in 1969 to become the vice chancellor of university and student affairs at the University of California, Irvine. Part of his role was to integrate the new campus with the emerging city of Irvine. Even though he moved across the country, he remained involved with his alma mater, including serving as an alumni-elected trustee. Wesleyan honored him in 1985 with the Distinguished Alumnus Award. He returned to the Northeast during the late 1970s to serve as president of the New England Board of Higher Education, where he worked until retiring in 2001. His marriage to Carla Guarnaccia ended in divorce. His second marriage, to Jody Benjamin, also ended in divorce. She died in 2010. In May 1980, Mr. Hoy married Marie Esterline. Upon returning to Massachusetts, Mr. Hoy first lived on a farm in Pepperell and raised Morgan horses and sheep. He then moved to Duxbury nearly 30 years ago. 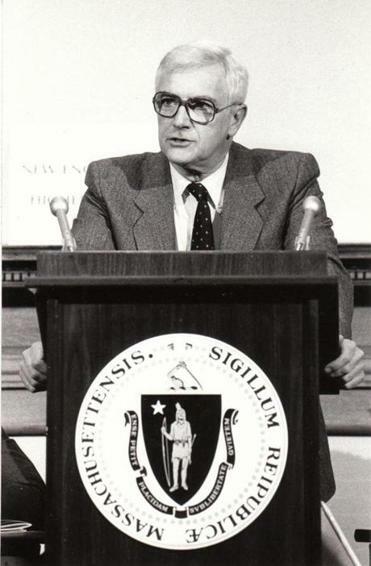 When Mr. Hoy retired in 2001, US Senator Edward M. Kennedy entered into the Congressional Record a tribute to his work with New England Board of Higher Education. “Since he became president of the board in 1978, Mr. Hoy has led the effort to provide an accessible and affordable education for every New Englander,” Kennedy said. A service has been held for Mr. Hoy, who in addition to his wife and son Peter leaves three other sons, Johnny Hoy of West Tisbury, Joshua Hoy and Wallace Nichols, both of Davenport, Calif.; three daughters, Jill of Somerville, Elizabeth of Brooklyn, N.Y., and Jen of Laguna Beach, Calif.; and seven grandchildren. Mr. Hoy wrote several books and articles about the college admissions process and higher education policy. He also was a published poet, and while working at Lake Forest, he helped coordinate a Midwest poetry circuit to bring poets to other colleges to share their work. Michele Richinick can be reached at mrichinick@gmail.com.